The conclusion of Avengers: Infinity War brought nothing but pain to the hearts of Marvel fans around the world as Thanos snapped his fingers and wiped out half of all life in the known universe, including the likes of several beloved heroes. There's nothing that could've exactly prepared fans for the losses of characters like Black Panther, Spider-Man, or Scarlet Witch, but there was a scene early on in the film that hinted at a gap between two groups of Avengers. If you pay close attention to a couple of shots from the scenes at the Avengers compound, the heroes are split up by who lives, and who dies. Many fans have looked back to the position of the characters sitting at the table in Captain America: Civil War, as those on one side of the table die in the following Avengers film, while the other half remained alive. A similar situation takes place about halfway through Infinity War, when Captain America takes his team back to New York. Think back to the scene in which Rhodey is talking to General Ross on a hologram at the Avengers compound and Steve Rogers makes his entrance, accompanied by Black Widow, Scarlet Witch, Vision, and Falcon. Ross tells Rhodes to arrest them, which causes him to hang up on his commanding officer and reunite with his friends. This is where you need to look closely. 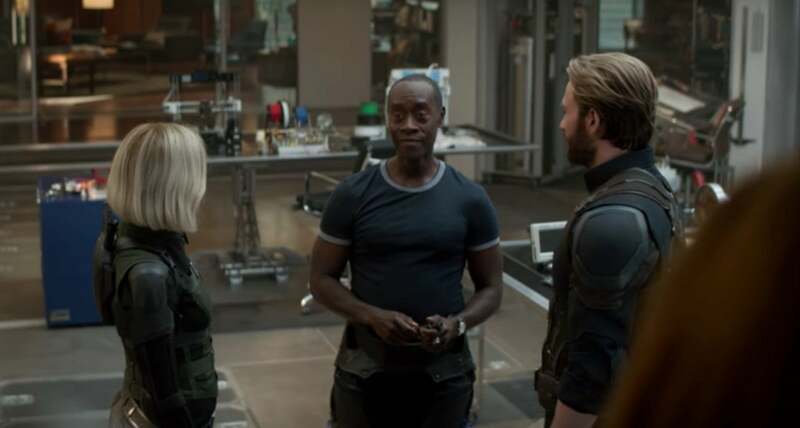 All of Captain America's team is standing at the top of a small flight of stairs, in the hallway outside of the room Rhodey is in. After the call is over, Cap and Widow walk down the stairs to join Rhodey. It's worth noting that a few seconds later, Bruce Banner joins them in the same room. So now three characters are left on their own, upstairs in the hallway. Vision, Scarlet Witch, and Falcon remain on their own. Remember, all three of these heroes are dead by the end of Infinity War. Vision is killed when Thanos rips the Soul Stone from his head, while Vision and Scarlet Witch are lost to the Snap. Everyone on the ground floor - Captain America, Black Widow, War Machine, Bruce Banner - survive the battle with Thanos and the Snap, and all four of them will battle the Mad Titan in Avengers: Endgame. This positioning is just one of the many ways in which the folks at Marvel teased the events of Infinity War, and there are likely twice as many hints to the eventual outcome of Endgame, we just won't understand them until after we've seen the movie.